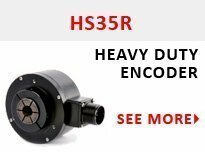 The AD35 absolute encoder’s short mounting depth allows for installation in tight motor endbells. With up to 10,000 RPMs, this encoder is suited for high speed servo motor applications. The AD35 is designed for integration into BLDC servo motors allowing digital feedback to drive the motion controller. The AD35 is the shortest hollow-shaft encoder world wide.